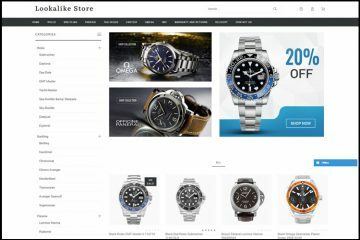 You can’t deny that these days appearance is very important when it comes to choosing a store where to place and order and Hontwatches.com is certainly an online replica watches website that looks very professional and elegant. I like everything about its looks: the black, white and orange scheme, the huge main banner, the secondary medium size banners and the nice product pictures. It has everything it takes to convince you that it is a shop worth trying. The main menu is pretty simple. It doesn’t list a huge number of brands and it doesn’t look very impressive either. It just has four buttons for Home, New Products, Featured Products and Contact Us. The actual products menu is listed in the lower left side of the page, after scrolling down through the promotional banners. 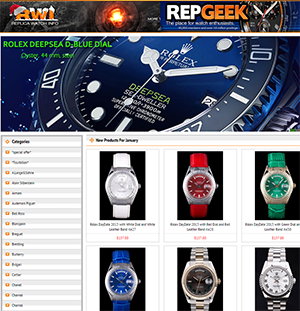 The company offers numerous brands that can be viewed in this section of the site. There are over 30 available watch company names, very famous designers that are adored by countless watch fans around the globe. 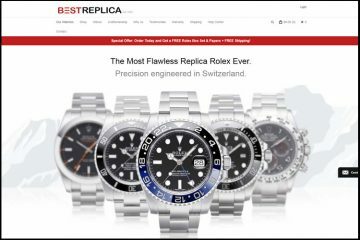 Hontwatches.com sells both Japanese and Swiss made replica watches. The Japanese replica watches cost about $100-$280 while the Swiss replica watches cost over $400. Maybe you are curious to know what the difference between Swiss and Japanese replicas is. Well, manufacturers claim that Swiss watches have a better quality mechanism that is more accurate and also lasts longer. It all depends on whether you are ready to pay the extra couple hundred dollars for the promise of getting a more exact replica. There is no Advanced Search option or price filter on the site, but I guess that this is ok as long as the company organizes its brands into collections. This eases a lot the search of the desired style of replica watch. Also, the product description page is very thorough and detailed in presenting all the important specification that anyone needs for realizing if the imitation watch is of good quality or not. The replica watches have only one picture. There are no detailed photos and the images seem to be copied from different sources. Before placing the order, I recommend that you ask for pictures of the actual replica watches the company sells. Hontwatches.com can process payments by Visa and Mastercard. These two payment methods are excellent from my point of view. There is no payment option more secure than credit card as your bank is the most involved party when it comes to secure your online transactions. It will always protect your funds for any scam attempts. The company ships packages worldwide and the delivery takes about 7 business days. The packages are shipped with EMS and the shipping fee starts at $19. Of course, all packages are shipped with a tracking number that allows you to see the progress of your package at every given moment. 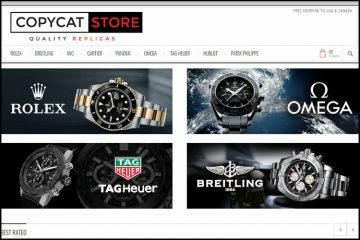 If you have purchased a replica watch from this store then you will be glad to find out that a 7 days return and refund policy is available. If you aren’t satisfied with the product simply contact customer service before the 7 days run out and request the return details. They will be able to replace the knock off or return your money. Customer service is reachable by email and by contact form so for any questions you might have; please do not hesitate to get in touch with the company’s representatives. In fact, before placing any online orders you should always test customer service. This is the surest way to confirm how professional the company really is. 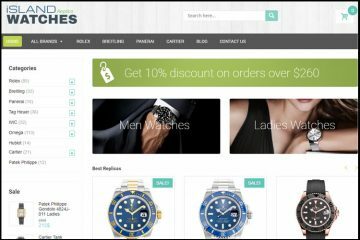 So from all points of views HontWatches.com is an online replica watches store that feels very professional and reliable. It ships packages worldwide, it accepts credit card payment and it offers a 7 days refund and replacement policy. When I tried to go to the site, Avast stopped me and said it was a malware site. It’s either been hacked or was always a malware site. Don’t go there. I bougth a cartier model and they sent me another model that I did not like at all. so I hav been writings mails to complain with NO answer at all.